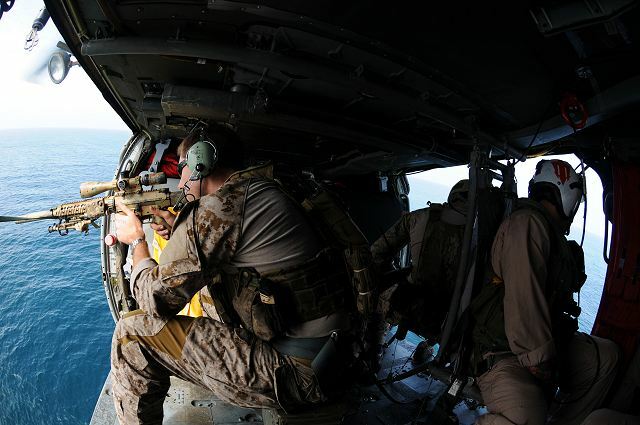 While the government was shut down, U.S. special operations forces conducted two simultaneous raids in Libya and Somalia on Saturday, October 5. In Somalia, around two dozen operators from U.S. Navy SEAL Team 6 (the same team that killed Osama bin Laden) landed by boat on Baraawe, a coastal town in southern Somalia, in the dark, early morning hours. Their goal was to capture a member of the Somali Islamic militant group al-Shabaab named Abdulkadir Mohamed Abdulkadir — also known by the nom de guerre Ikrimah. Kenyan intelligence said Ikrimah, who is a Kenyan national of Somali descent, is connected to terrorist plots against “Kenya’s Parliament, the United Nations office in Nairobi, Kenyan military installations, an Ethiopian restaurant in the Kenyan capital and an airport”, all of which never materialized, reported the New York Times. However, the Times notes that Ikrimah “is seen as a pivotal connection for an array of extremists across vast distances, from Tanzania to Yemen — a veteran militant with intimate knowledge of the ties among Kenyan terrorists, the Shabab and Al Qaeda.” This is what made the United States government want to capture him. The Libya raid turned out differently. Suspected al-Qaeda member Nazih Abdul-Hamed al-Ruqai, also known by the alias Abu Anas al-Libi, was captured by U.S. Army Delta Force operators in Tripoli. His 21-year-old son, Abdullah al-Ruqai, described the scene to the Guardian. After morning prayer, as his father walked to his car, a black Hyundai Tucson, outside their Tripoli home, three masked men with handguns leapt towards him from a white Mercedes van. “Just as my father was parking, these cars came from everywhere,” Abdullah told the Guardian. “There were three white cars which blocked the street, then came the van, all of them with tinted windows. The van pulled up and 10 men got out; three of them had masks and handguns fitted with silencers.” The men, some of whom shouted “Get out, get out” in Arabic, dragged al-Libi and threw him on the car’s hood as he shouted “What’s going on?” Al-Libi was drugged and dragged to the van across the street, according to his son, “His body was floppy, he wasn’t speaking, they must have drugged him.” Within seconds, the cars drove off and no shoots were fired. Abdullah also alleged that Libyan security forces were with the U.S. commandos. He said seven of the men “looked like amateurs” and “shouted with Libyan accents and moved like Libyans.” However, the Libyan government claimed it did not know of the operation before it happened. Both raids underscore the Obama administration’s embrace of rendition, the practice of kidnapping people suspected of terrorist ties in sovereign countries so that they can be detained and interrogated by the U.S. without access to a lawyer. The Bush administration infamously snatched and sent people to CIA black sites or third-party countries where they were detained for long periods of time, interrogated, and tortured. Many of those held in black sites were transferred to Guantanamo. Months after Obama stepped into office, his administration announced it would continue rendition but with more oversight. Sometimes referred to as “enforced disappearances”, rendition violates international human rights standards. The Obama administration did close CIA black sites. However, it has found other ways to continue rendition. In the al-Libi case, it merely substituted CIA black sites for a U.S. navy ship — the USS San Antonio — in the Mediterranean. There, al-Libi was interrogated by a “clean team” known as the High Value Detainee Interrogation Group — a special task force of interrogators from the Pentagon, FBI, CIA, and other agencies. He was not read his Miranda rights on the ship. One week later, after complaining of a medical condition that prevented him from being interrogated any longer, al-Libi was sent to the United States to stand trial. Even though al-Libi has been indicted by a U.S. federal court, what he told interrogators on the San Antonio is inadmissible in court. This is very similar to how details of detainees’ treatment in U.S. custody, including torture they experienced, are classified with severe restrictions on discussing them in the Guantanamo military commissions. Even to the point where defense lawyers can’t talk to their clients or reporters about the torture the detainees experienced. Along with the bloody terrorist attack in Nairobi’s Westgate Mall, the two raids signal how Africa is becoming the latest hotspot in the war on terror as the wars in Iraq and Afghanistan wind down. Although, last month, the Defense Department announced that nearly 9,000 troops will be deployed to Afghanistan this winter before the 2014 withdrawal. Already, the United States is funneling weapons to governments like Rwanda and Uganda, training African proxy forces — sometimes through private military contractors — and conducting secret surveillance missions. It also has drone bases in Ethiopia and the Seychelles and runs a secret prison in Somalia. Over the next 25 years, the Pentagon is pumping $1.2 billion to expand its base at Camp Lemonnier in Djibouti, which is a key hub for U.S. counterterrorism operations, including air and drone strikes, and military power projection throughout the Horn of Africa. Camp Lemonnier is the only permanent U.S. base in Africa. The Pentagon is also expanding bases in Manda Bay, Kenya; Entebbe, Uganda; Burkina Faso, and other military sites in Africa. Additionally, the U.S. Marine Corps is assigning three special operations battalions to the Asia-Pacific region, the Middle East, and Africa. The battalions will have “new training and missions”, according to ArmyTimes. What these raids ultimately signify is the Obama administration’s continuation of rendition and expansion of the global war on terror into Africa.